The recent weeks have been really great for me. Some close friends already know that I am joining Yahoo! in the next two months. I seldom blog about anything personal but I figured it’s a great news (for me at least) and I am really excited so I am sharing it here. Please don’t send me many emails, IM messages or Facebook notes to ask about “insider news” about the company. Champagnes, whiskies, dark Goldiva chocolates are very welcomed though. Today, I received a big gift box from my one of my dearest friends, Kevin who is currently still stuck in US with his phD program. The content of my gift: a huge book, Revolutionary Wealth, a real cool design magazine, GOOD (anniversary issue), a Sci-Fi series – The Triangle, a nice but very noisy musical card (it says, “you gotta sing the song that’s in your heart… and my song goes Yahooooooooo!!!!!) and a hilarious Elmo (it’s hilarious because it laughs funny when you press the tummy). Alright, no champagnes and chocolates but the thoughts count alot! Thank you, Kevin! 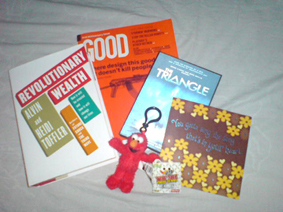 This entry was posted in Some Random Musings and tagged Books, elmo, good magazine, revolutionary wealth, the triangle, US, Yahoo by Priscilla Tan. Bookmark the permalink. Hah Stan, so observant ! @ Kevin – how long do you think the battery in elmo will last? Thanks Erwin! See you soon, I hope!! You leaving for Yahoo!? But…but…your Macallan project…noooooooo…. Hahhaa. Unfortunately, i have to pass on the whisky to my other colleagues. BUT! we can always catch up for more whisky ourselves!